Currently supporting all features. We talk and discuss with other nodes before deciding on what to vote. We would like to consider lessors opinion once there will be a practical and easy way to vote. We don’t have atm a project linked to our node, we just want to run the node professionally. WAVES token converter (at https://waveslease.com/): performance optimization and addition of USD conversion. waveslease.com has just sent Payment #12 to lessors. In this payment period the node mined 148 blocks and distributed a total of 1840.42 MRT (Miner Rewards) and 17.42530147 WAVES (0.117 WAVES per block). Team has bought a total of 245 WAVES and these have been leased back to the node, bringing the personal stack to 1551 WAVES. Payment #13 will be sent on 25th August. waveslease.com has just sent Payment #13 to lessors for blocks from 1124879 to 1141007. In this payment period the node mined 83 blocks and distributed a total of 1415.45 MRT (Miner Rewards) and 7.32 WAVES. Payment #14 will be sent on 31st August. Waves Lease node is currently paying biweekly. Waves Lease node will start paying weekly. Waves Lease Node recently created 1.000.000 of Waves Lease Loyalty Token (WLLT). A first distribution of 10 WLLT Token will happen for each forged block to their lessor (depending to the share of leased waves) from 25th September 2018 to 31st December of 2018. (1) Lessors with Promo 100% for life will receive 100% dividends of WAVES Fees. Waveslease.com is a small node that pays regularly. You can check payments proofs on the blockchain as well on our blog. Please lease to our node to improve WAVES network decentralization. waveslease.com has just sent Payment #14 to lessors for blocks from 1141391 to 1151143. In this payment period the node mined 60 blocks and distributed a total of 5.1912431 WAVES, 548.2 MRT (Miner Rewards) and 599.97907 WLLT (Waves Lease Loyalty Token) for a total fee of 0.09135 WAVES. Payment #15 will be sent on 7th September. waveslease.com has just sent Payment #15 to lessors, for blocks 1151248 -> 1161481. In this payment period the node mined 75 blocks and distributed a total of 520.39 MRT, additional 163.67 MRT to WLLT Token Holders, 749.96 WLLT (Waves Lease Loyalty Token) and 22.344 WAVES. Payment #16 will be sent on 15th September. waveslease.com has just sent Payment #16 to lessors, for blocks 1161482-> 1173331. In this payment period the node mined 53 blocks and distributed a total of 312.94 (220.18 to Lessors and 92.76 to WLLT Token Holders), 529.97 WLLT (Waves Lease Loyalty Token) and 8.172 WAVES. The node after the upgrade to v 0.14.4 forked, so we had to reimport twice the blockchain causing some downtime. We used this discontinuity to buy a more powerful server and move the node. The old server will act as a backup/failover and possibly testnet server that we will use to minimize the downtime while upgrading the next time. Payment #17 will be sent on 22nd September. waveslease.com has just sent Payment #17 to lessors, for blocks 1173332 -> 1183428 . In this payment period the node mined 69 blocks and distributed a total of 763.34 MRT ( 483.59 to Lessors and 279.75 to WLLT Token Holders), 689.96 WLLT (Waves Lease Loyalty Token) and 28.25 WAVES. Payment #18 will be sent on 29th September. waveslease.com has just sent Payment #18 to lessors, for blocks 1183429 -> 1193664 . In this payment period the node mined 67 blocks and distributed a total of 613.26 MRT ( 460.14 to Lessors and 153.12 to WLLT Token Holders), 669.96 WLLT (Waves Lease Loyalty Token) and 30,98 WAVES. Payment #19 will be sent on 6th October. waveslease.com has just sent Payment #19 to lessors, for blocks 1193665-> 1203919. A total of 22.07275148 WAVES, 348,62 MRT + extra 109.58 MRT to WLLT holders, and 600 WLLT has been distributed . Payment #20 will be sent on 13rd October. waveslease.com has just sent Payment #20 to lessors, for blocks 1203920 -> 1214162. A total of 21.81549029 WAVES, 388 MRT + extra 121.96 MRT to WLLT holders, and 700 WLLT has been distributed . waveslease.com has just sent Payment #21 to lessors, for blocks 1214163 -> 1223942. A total of 33.32 WAVES, 443.76 MRT + extra 0 MRT to WLLT holders, and 610 WLLT has been distributed . 70% to lessors, 20% to WLLT token holders. 50% to lessors, 40% to WLLT token holders. Payment #22 will be sent on 27th October. 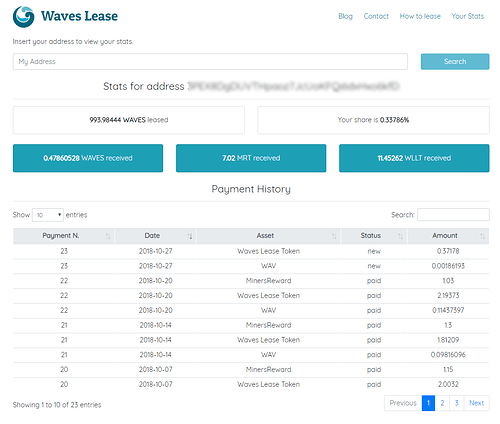 waveslease.com has just sent Payment #22 to lessors, for blocks 1223943 -> 1235214. A total of 38.28 WAVES, 307.71 MRT + extra 271.38 MRT to WLLT holders, 690 WLLT has been distributed . Payment #23 will be sent on 3rd November. We remind you that you can give your feedback or give suggestion for website improvement by writing at the email [email protected] . Hi, doncassanova90, for now there isn’t a minimum amount requested. Profit is hard to calculate but once leased you will be able to check it in almost real time by poining at this URL: https://waveslease.com/index.php/stats/address and by inserting your address. Please be aware that data can be behind 5 minutes, as our script sync blockchain data every 5 minutes. waveslease.com has just sent Payment #23 to lessors, for blocks 1235215-> 1245162. A total of 4.97 WAVES, 328.63 MRT + extra 94.18 MRT to WLLT holders, 690 WLLT has been distributed . Payment #24 will be sent on 10th November. Just leased 1.5 WAVES when do i start getting my reward pls. Next payment its scheduled on 10th November. waveslease.com has just sent Payment #24 to lessors, for blocks 1245163-> 1255468. A total of 11.52 WAVES, 376.98 MRT + extra 107.68 MRT to WLLT holders, 510 WLLT has been distributed .